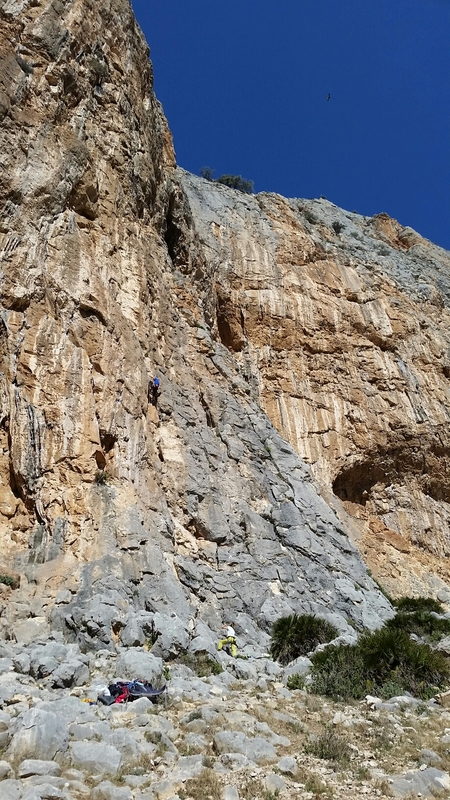 After a slow start to allow time for the sun to get over the crag and begin to warm the van, we trundled down into El Chorro. It’s had something of a makeover since I last visited three years ago. The Camino del Ray has been refurbished and transformed into quite a tourist attraction, and the couple of bars have been tarted up. 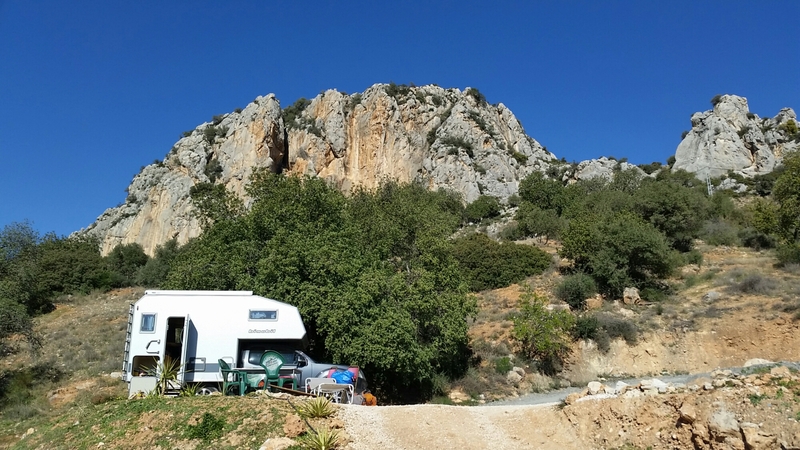 We reestablish Base Camp at The Olive Branch, a welcoming though slightly quirky Brit-run bunkhouse and campsite. Great location beneath the Encantades sector. Clear blue skies, but a bit of a breeze, so Justin and Chris suggest sector Momia on Frontales Medias. Without really realising it, we arrived and put our bags down immediately underneath the route Ak Sunamun. I’d followed Jake up this about 3 years ago, and had logged it on a mental tick list of possible 7b+s I might try. I’d only messaged him the night before to remind me of the name, and here I was sitting underneath it. The fates collide. …but did I want to be in a collision? After a bit of a rest, the climb went surprisingly easily – a mammoth struggle, but I never really thought I was going to fall off. Nearing the top, I headed right and touched the chain to ‘tick’ the 7b version in Rockfax, then reversed a few metres and headed out left up a prickly undercut flake/groove. Just a couple more bolts lead to the original lower off of the route and my first 7b+ 🙂 * Happy Days! Time for beers and sunset with views for a million miles over Andalucia!